It’s been an exhausting few weeks since the last blog, and unlike some I find it difficult to write blogs in the odd cafe, while waiting for the lights to turn green, or when sitting on the back of a Bactrian camel. Anyway, my exhibition of the paintings from the Arctic Light book went well in the superb Osborne Studio Gallery in Belgravia last month. In fact you can still see the catalogue on their website, www.osg.uk.com Although they are of course, paintings of the Arctic, there is a lot you can learn from studying the images for composition, colours, skies, moods, etc. I thought you might like to see how the cartoonists see me – here’s a great caricature of me drawn by the excellent caricaturist Gary whose work is regularly featured in the Sunday Times and Daily Mail. This one appeared in The Lady recently when they did a profile on me. Is that a mischievous twinkle in the eyes? After the exhibition I ran a course in St Davids and we were blessed with good weather. Although the wind was a bit strong, this really gave us some interesting boisterous seas, with great splashes when the really big waves came crashing in from across the Atlantic. One balmy afternoon on the cliffs in warm and stunning sunlight was truly unforgettable, and perfect for sketching. I’m delighted to report that my Arctic Light book has just been awarded best outdoor book by the Outdoor Writers’ & Photographers’ Guild, on top of a marvellous batch of reviews. Although it’s not a how-to book it sells well at my demonstrations and workshops, as it’s packed with interesting and at times dramatic compositions and skies, as well as the many tales and sometimes absurd situations that seem to follow me around. I’m told many have put it on their Christmas list. Enjoy your painting! This entry was posted in Arctic Light Book, atmosphere, David Bellamy and tagged #arcticlight, Arctic sketching by David Bellamy. Bookmark the permalink. 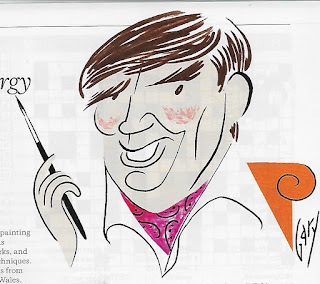 Love this whimsical simple drawing that captured the essence of a happy guy with paint brush. Really like the Arctic paintngs. Who knew there were so many colours in a bkeak wilderness? How I would have loved to see your Arctic Light exhibition! Is Caricaturist Gary likely to do a whole book of caricatures of you? (Of you in the Arctic maybe?) It would be another excellent book! Thanks for your blog David and I am so happy to hear how well your Arctic Light is being received. Visiting friends and relatives have admired my copy and a couple of them would like their own one. Love the brill cartoon and from photos of you Gary has certainly seemed to capture something. That is a skill in itself. Oh to be on the clifftop in Pembrokeshire with the waves crashing in! Three sets of my friends have recently had their first visit…including last week in the stormy weather. All are converts of course,despite the conditions. I am currently experimenting with rock pool paintings…..sadly only from my old photos….